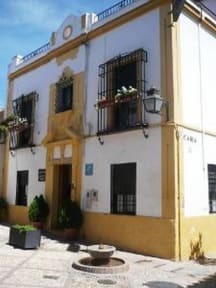 Pension Cibeles i Córdoba, Spanien: Reservér nu! Pension Cibeles is located just a few minutes walk from the imposing mosque in the city, one of the most impressive examples of Spanish-Muslim architecture. The property offers a quiet and family has been built around a traditional courtyard. It also has a terrace where you can enjoy all the sun of Spain. Check out time between 7am to 12pm.